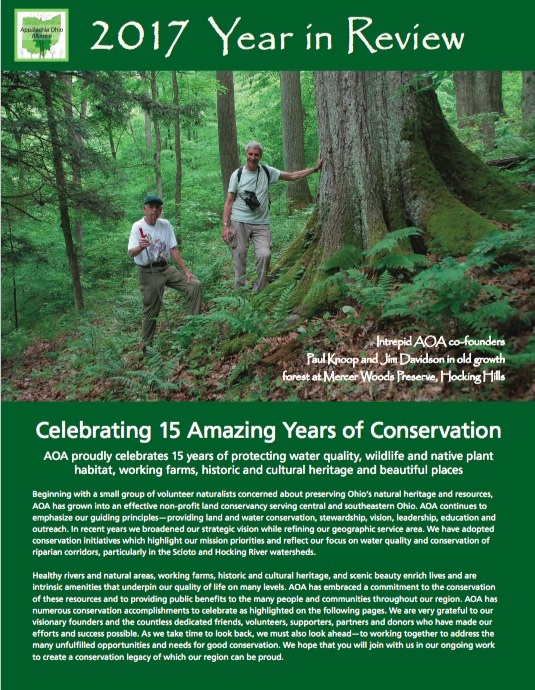 As the holiday season approaches, the Directors and Staff of the Appalachia Ohio Alliance (AOA) would like to thank you for your interest in and support of our conservation work. The generous contributions of our friends and neighbors enable us to preserve precious land and water resources, making a lasting difference in the sustainability and livability of our region. The AOA year-end Annual Campaign helps raise some of the monies needed to carry out the numerous actions necessary to protect our valuable land and water resources. We are asking for your help, above and beyond normal membership dues, so that we can continue to fulfill this important mission. Together, we can ensure that our land is both an asset and a legacy for our community. With your support we have succeeded in protecting many acres of very special natural areas, working family farms, scenic areas and heritage sites – with over 8,000 acres conserved so far. Enclosed is a copy of our 2015 Year in Review which summarizes some of our accomplishments and activities during the past year – including newly conserved lands and many exciting programs and projects. These are just some examples of how you have empowered AOA and why we need your continuing support. Although we have achieved a great deal, I am sure you will agree that much more remains to be accomplished. During the upcoming year we hope to complete a large number of very worthy conservation projects that we have in process. We will also be collaborating with our partners to undertake several major conservation initiatives that will increase conserved lands in Central and Southeastern Ohio, creating connectivity and reducing threats to our land and water resources from undesirable impacts. Your financial support is critical to our continued success in these and many other endeavors. We ask you to consider a special year-end gift to our Annual Campaign fund to help strengthen our capacity and resources to better conserve and steward more lands. We will gladly accept gifts in any amount. Thank you in advance for your support – we very much appreciate your generosity. I hope that you are as excited as I am about our future and will join us as we strive to make our conserved lands a community asset that we can all be proud of. Best wishes for a wonderful holiday season and the coming new year.